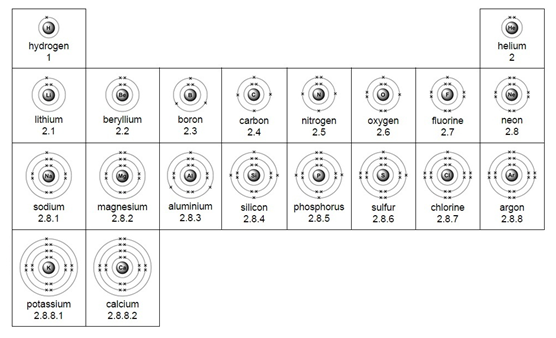 Electrons are found in a series of shells (or energy levels) around the nucleus of an atom. Each energy level can only hold a certain number of electrons. Low energy levels are always filled up first. 1) Use the periodic table to look up the atomic number. Chlorine’s atomic number (number of protons) is 17. 2) Remember the number of protons = number of electrons. Therefore chlorine has 17 electrons. The electron arrangement can also be draw in a diagram. Elements in the same group of the periodic table have the same number of electrons in their outer shells, which means they have similar chemical properties.